I tack maps to my walls. In my bedroom. In my office. Postcards, but not photos, surround them. One map is of China. Next to it is another of the South Pacific—Korea, Taiwan Japan, Indochina, the Indonesian and Polynesian islands jetting out from China’s mainland mass. 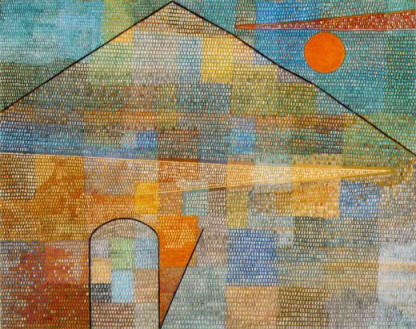 Around China are my postcards of United States’ Southwest—canyons, mountains, deserts, sand dunes, and Anasazi ruins; interspersed is a postcard by Klee, another is by Chagall. Another map is of Europe, though its dated and no longer reflects today’s geopolitical realities. It’s large and imposing and ironic to the Chinese, who, instead of putting Europe at the center of their maps, put China and the Pacific Ocean at the heart. Next to Europe are several art postcards from museums in Paris, Munich, Albi, Brussels and Basel and as well as postcards of French and Alsatian landmarks, touristified to the fullest essence of an identity. I look at these maps in dreams and memories, in localizations and forgotten in-betweens. The postcards are fragments of idealized places I once was, once lived in, once traveled through. Some are postcard format art prints, shrunken, bastardized versions of artworks I once stared at in quiet contemplation. There are no photos up. Just these arranged clippings and their captured, captivating (im)permanences. Home has been many places, many where’s but perhaps equally nowhere. I once was there eating or looking, walking or staring, smelling or listening, feeling or thinking or something other in-between. I was perhaps alone or with others talking. All the same, that there, even in the briefest of passing, took on something more, something more memorable as I felt my presence met in a shared world of living. We’re always sharing a world, though we don’t always feel our place. So that there took on more meaning for me, for us until it percolated into a solidified into a home. And then until I left, as we all must, whether in departures or in death. With my postcards, my photos unposted, my notebooks, my memories and myself. I was off somewhere else, familiar, new-sprung or in-between, carrying only the sensed feeling of new smells become old, of old smells now forgotten, and of forgotten smells now reembodied. And, of course, with new smells unimagined to come. But on my walls, the smells can’t be posted, couldn’t be tacked down. I can hardly write what they are or what they mean. Their ephemeral essences skirt our memorializing and mathematizing grasps, yet they remain. As Proust has told us and neurobiology has started to confirm, smells connect deep into our emotional memory. We all feel from time to time the memory of a fragrance taking us back somewhat beyond our control to a place once was. Their holding is of a unique genre. Smells speak to us, pull us back to a depth, and yet we can’t quite share them with another, even a lover, except in evoked silences, because frankly the description of a smell or flavor in words, photos, maps and postcards is fleeting at best and flawed in hopelessly attempting to pinpoint the pointless. Smells can’t exactly be pointed to, though they could have been shared. It can only be referenced, not truly described. The then and there of a fragrance that we once had can simply be evoked in the hope of an already shared experience. Savors, these are ours alone, mine, no one’s. How do ever we speak out and over and beyond these shadow edges? There is nothing ambiguous about a smell, a taste or sensual holding. These essences are the glue to which we lack the words. The ambiguity falls to our retelling, to our words, which so strain, yet so fail to capture such that a smell makes us feel in memory. That smell then and there that meant this or that. That fragrance over a dinner with him or her that felt so forever. And so, I’m left staring at my postcards, maps and art prints. My remembered homes and storied selves, fragmented, yet held in my telling. My friends who are somewhere else and can no longer speak to me, just echo through me in stilled re-memberings. The postcards and and maps evoke like a smell their absence, which can never transcendentally describe. I try to write to you around and through these absences. I try to fill-in the gaps for myself of what once was so implicit, so concrete, so fragrant yet now is so fleeting, so nearly forgotten. The fragrant remainder. I try to remember my homes, my friends and my shared life-worlds, even as I rebuild anew here in China. The absent friend. This is my tale. It’s built upon the language of others and a together life-world already up and running at my birth. It’s grown upon the inter-crossing of my own experiences, learnings and discovers through and from others. We all live in a world of our own social construction, which is the foundation of all happenings, all relationships and all meaning. We are never alone as current and past communities touch upon our every act or utterance. And so amongst the cracks and crevices, we are always constructing a world in which we feel at home. But sometimes we don’t. And sometimes it isn’t. And often all we have our gaps and remainders to things so seemingly at the heart of it all. And so we must cope in our creative and traditional ways and continually reweave the fabric of our communal worlds with our caring hands and our personal and interpersonal threads. Home is where the heart is, as the phrase goes. But what is the where of the heart and the heart of the where that makes a home so homely? A question for which we answer alone and the task to which, though forever unfinished, unfinishable, we undertake together apart.